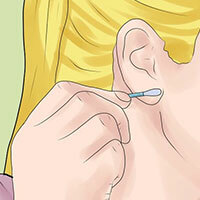 Newly pierced ears: how to take care of pierced ears?Newly pierced ears: how to take care of pierced ears? Newly pierced ears: how to take care of pierced ears? How to care for newly pierced ears? Any piercing is a wound, and to heal it successfully it is required to do two very important things: not to interfere with the body self-healing the wound and keep it clean so that evil infection doesn’t get into your body. What do I need for newly pierced ears care? How to take care of pierced ears? A fresh piercing puncture should be rinsed 3-4 times a day. Use the saline bath to clean newly pierced ears from dried blood, dead cells, secretions and other dirt outside. Within a few minutes the saline solution will do the job, soak the crust, and all you have to do is gently remove excess with a cotton swab (Tip: Do not peel it off with your nail and do not rotate the piercing). Remember to rinse the piercing puncture spot with clean (preferably boiled) water to be sure that it has no salt left after the saline bath. 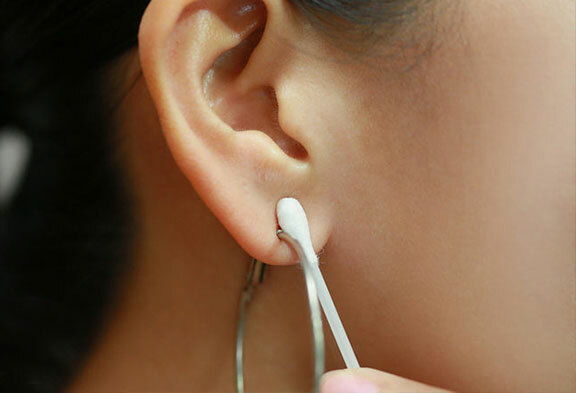 These procedures can be carried with your newly pierced ears out 2 times a day – morning and evening, and the rest of the time just use antiseptic. Since the dirt or dust can easily get into a piercing puncture, you should apply a gauze satured with antiseptic after any contact for at least a couple of minutes (after sleeping, walking, sweating and just someone’s touch). A swelling may appear at the piercing puncture spot in the early days. Do not be afraid, this is completely normal. However, if within a week the swelling does not disappear, it is necessary to call your piercing master and listen to his recommendations. To avoid the piercing puncture overdrying it is necessary to reduce the number of bathes up to 1 time a day and use an antiseptic only when needed. Now, if you carefully followed our instructions for your newly pierced ears and successfully passed primary healing, the swelling’s gone down, and the puncture is not excrete lymph. You still need to continue to do preventive baths with saline a few times a week, but it is desirable to replace the primary piercing with the final short one so you don’t accidentally hook it. Certainly it is better not to do it yourself and not be lazy to walk to your piercing master, where he will replace it with the help of special tools that will eliminate the possibility of injury. Do not touch the puncture. The less you disturb the wound the faster it heals. Do not rotate and especially not to remove the decoration. Do not use peroxide, alcohol or any other aggressive substances. Don’t use ointments, because of the very pleasant consistence for bacteria. When visiting bath, swimming pools, sauna and solarium it is necessary to seal the puncture spot with a plaster or an adhesive dressing. Avoid getting cosmetics and perfumery into the puncture. Don’t drink (or at least minimize the use of) alcohol, smoking and taking an aspirin. All of this dilates blood vessels and increase the bleeding, thereby prolonging the healing. Remember that the puncture is not healed with a miracle cure, but your body. It is therefore desirable to well ensure the hygiene (wash clothes, bed linens, wash and brush your teeth) and to support the immune system at a decent level (take a combination of vitamins and minerals, good sleep, drink plenty of pure water and exercise).